Cecile Charpentier received a degree in the Conservation and Restoration of Art Objects. In 1994, she had earned a diploma from the University of Paris I, Panthéon-Sorbonne: Master II, (Maitrise de sciences et techniques). She had previously graduated from the Ecole du Louvre in 1987 with degrees in both Art History and Museology. She is fully accredited to work on the collections of the Museums of France. Specialized in the conservation and preservation of the paint layer, Cecile Charpentier executes commissions for institutions both public and private as well as for collectors, art dealers and art experts. She is called upon to evaluate the condition of works of art before restoration and, as a consultant, makes diagnoses prior to auctions or purchases. She also conducts research and writes reports on historical paintings and artists in both French and English. 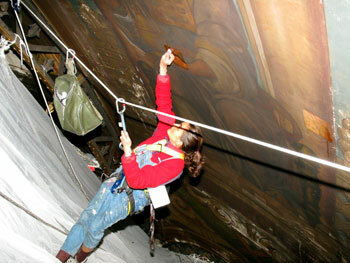 For extensive sites requiring different competences, such as the restoration of the support of the paintings, Cecile Charpentier gathers together a team of accredited professionals. She is often called upon to work in other countries (Italy, Spain, China and the United States). Since 2010, Cecile was the project manager, representative and coordinator of some important restoration sites. As conservator-restorer of cultural heritage, Cécile Charpentier has always carefully observed and respected with the greatest rigor the specific requirements and tenets of art restoration field and intervenes only when it is strictly necessary for the preservation of the work of art. Her art history training has led her to take an active interest in the history of art as well as history of art restoration. For Cécile, understanding the painterly techniques used by artists is crucial when deciding how to intervene. Cecile Charpentier’s education in art history has led her beyond that of painting restoration to researching artists' techniques; her training has enabled her to grasp the language used by artists. She has always observed the rigorous requirements of her profession, and in deference to the works of art, has never engaged in interventions that go beyond that of the preservation of the art object. This has required her make all the necessary decisions before and during her interventions. She has always sought to distinguish the original work from subsequent restoration, including earlier additions of glaze, varnish and overpainting, whether they concern the artist’s own actions or interventions by various restorers over the centuries. Her scientific background has allowed her to choose the most adequate materials, the most appropriate solvents and the technical methods to ensure the protection of the painting. Before setting out, she defines the different substances that compose the surface layer and carefully studies all the previous interventions. She refrains from any operation whose reversibility and stability are not perfectly assured. Although usually working on site for the restoration of large-size paintings and murals, she has created her own studio in Paris that provides enough height and space to accommodate fairly sizeable formats. After a thorough study of a painting, she presents a detailed estimate listing the necessary procedures for the optimum conservation, and, if necessary, has tests carried out in laboratories. For all her work, she photographs, documents each stage and a scientific report is written describing in detail all the techniques, methods and products used. Fully responsive to the esthetic and ethical problems posed by antique painting, she is regularly commissioned to restore works of art from the 15th century to the present day.